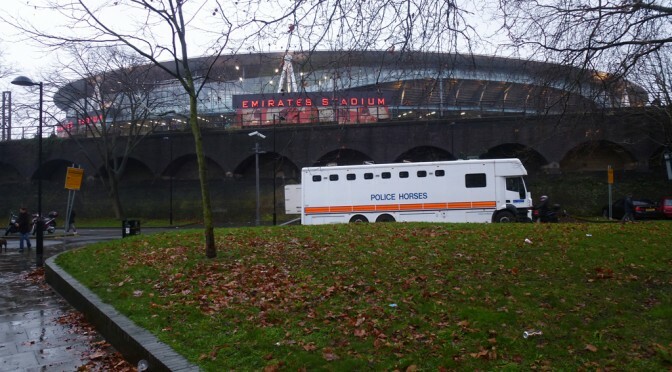 The Metropolitan Police (MPS) spent nearly £1m on policing Arsenal’s home football matches last season, new data has revealed. A Freedom of Information request to the police found that managing games for the 2013-14 season hit the public purse to the tune of £985,660. Further data has shown that fixtures against local rival Tottenham Hotspur have been the most expensive matches to control for the last two seasons running. The game between the two sides on 27 September 2014 cost the police an astonishing £77,000. More than 300 police were deployed for the game. However, the police had managed to make some savings compared to last season’s derby. 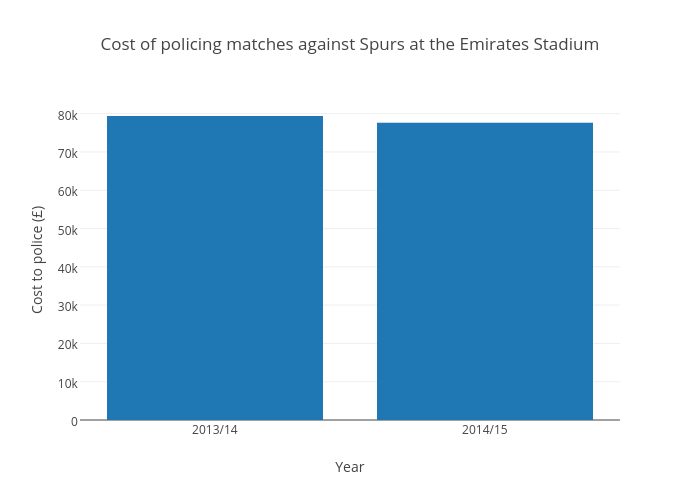 The data showed that the match between the two clubs on 4 January 2014 was the most expensive game to police over the last two seasons, costing £79,386. Last season, it was followed in cost by the Champions League game against Borussia Dortmund and the Premier League tie against Everton. Surprisingly, Arsenal’s Champions League clash against Turkish club Galatasaray, which was marred by crowd trouble and violence, was cheaper to police, costing only £58,000. Prior to the match fans set off flares in the Finsbury Park area and close to the Tollington Arms pub. During the match Galatasaray players Wesley Sneijder and Fernando Muslera were forced to ask their own fans to stop throwing flares onto the pitch as it was disrupting play. Stephen Greenhalgh, deputy mayor for policing and crime in London said: “We’re seeing this in football matches, and the police are not doing routine stewarding, and nor should they. The clubs are organising the stewarding when you go to the Tube stations. “The police will maintain public safety, they are not there to steward protests or football matches. Commander Peter Terry from the specialist crime & operations unit said: “For over a year now the MPS has been trying to get London football clubs to sign the Special Police Services Agreement which was drawn up to ensure football clubs bear the cost and any liability incurred for officers provided to police their football matches. “This follows a lengthy process of engagement with the clubs to discuss our position and give them ample opportunity to raise any concerns they might have. “Some clubs have already signed up to the agreement, however a large number have not yet signed and the new football season is fast approaching. “It is important, particularly in this time of austerity, that we get the best deal for Londoners, and that means looking at costs and where people can be most effective. “Historically, officers from across London have been taken out of their boroughs to support policing at football matches, often many miles away from their local communities. Those officers would be better placed within their own wards and neighbourhoods to support local policing needs. Arsenal declined to comment on the situation.